Navigate between the layers in the Timeline view, using keyboard shortcuts or the Animation menu. This way of navigating only works for unparented layers or the children of a parent layer. If you are navigating between unparented layers, parent layers can be selected, but their children will be skipped. If you start on a parented layer (child), only the other children of the same parent will be available for selection. In the Camera or Timeline view, select an unparented layer or child layer of a parent with several children. 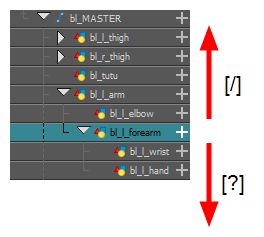 Animation > Select Previous Sibling or press / to select the previous child layer. 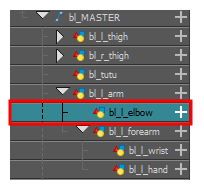 Animation Select Next Sibling or press ? to select the next child layer.